Easter is not a day- it is a season. This year begin your Easter preparation with Holy Week―because without the crucifixion, there would have been no resurrection. Had Christ not hung on the cross, taken on our sins, and then spent three days defeating Satan’s power, His rising again would not have been so meaningful. Starting this Sunday, March 24th –Palm Sunday – begin to read about Jesus’ last week on earth as a man. 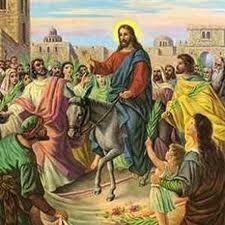 Start with the triumphal entry into Jerusalem and the meaning behind it as fulfilled by the prophets. Read Luke 19:28-42 ( also in Mark 11:1-10, John 12:12-20, and Matthew 21:1-9. ) and Zechariah 9:9 Reflect on how often you praise God just for coming into your life. Monday, March 25th – Read about Jesus at the Temple Luke 19:45-20:8 ( also Matthew 21:12-16. Mark 11:15-16, John 2:13-16 Reflect on your body as the Temple. What does Jesus need to clean before He can truly enter? Tuesday, March 26th – Read about Jesus teaching at the Temple Luke 20:9-9 ( and also Matthew 21:23-27, Mark 11:27-33.) Reflect on the times Jesus’ Truth have seemed harsh to you or hard to follow. Did you grumble and back away? Did you question Him? Wednesday: March 27th – Read Luke 20:41-47 & 22:1-6. (and also Matthew 22:41-23:7, 26;2-5, Mark 12:35-40, 14:1-11) It is sometimes hard to be a disciple of the Truth and the Way. Sometimes we want Jesus to do what we want or act the way we feel he should. Reflect on this and how that led Judas astray. Thursday, March 28th – Maundy Thursday – the Day of the Last Supper. Read Luke 22:7-45 ( have tissues handy.) It is also found in the other gospels. When you receive communion are you really doing it in remembrance of Him? His blood cleanses us from sin and His body feeds us the Truth on which we hunger for. How quickly do you go off on you own and not stick with Jesus. Tonight- see if you can spend one hour praying with Jesus. Scripture tells us He prays for us unceasingly. Friday, March 29th – Good Friday. Today sometime between 12-3pm if you can, reflect on Jesus’ death on the cross. Read Luke 22:47-23:48. You can also find it in the other gospels. If you can, attend a Stations of the Cross. Even if you sit in the pews and do not follow all the movements of kneeling, crossing your self, etc, it can still be a very heart-piercing service. Rent one of the movies about the life of Jesus on video and really watch it knowing He did this all for YOU. He loves you that much. As Michael Card sings- they didn’t have to nail his hands and feet because His love would have held him on the cross. Saturday, March 30th. Jesus is in the tomb, but wait. He is not. He has descended into Hell. The women leave his body in a tomb and hurry away because their tradition said they had to wait to prepare his funeral until after the Sabbath. Read Luke 23:50-56. ( Also in Mark 15:42-27, Matthew 2:57-61, and John 19:38-42.) As you prepare for Easter, and run around doing the last minutes things to prepare for the day, think of what Jesus is doing for your sake even though you can’t see Him. Sunday, March 31 – Easter ! Awaken with a song in your heart. HE IS RISEN -THE LORD IS RISEN INDEED!! Go to church. Be with family. Praise Him all day long for this wondrous act. And remember- every week is a mini Holy Week and every Sunday is a mini Easter. We may praise Him, and then not understand, we may back away, we may even turn to the world instead of to Him. But, we can come, kneel at his feet, give Him our sins and rejoice in forgiveness. We can approach His table and sup with Him. And we can do it all in remembrance, both today and forever more. Amen.